Chalk on a chalkboard. A framed map of the world on the wall. A pop quiz with a pencil and paper. While these learning space strongholds were sufficient for many decades, today’s classroom must meet the expectations of tech-savvy digital natives. Here’s how the team at Caldwell University, with a little help from Sharp, is making their classrooms more dynamic and interactive. A Sharp AQUOS BOARD in action. Located in the picturesque town of Caldwell, NJ, Caldwell University offers a stunning campus setting and a wide variety of undergraduate and graduate degrees to its approximately 2,200 full-time and part-time students. In the aftermath of Superstorm Sandy in 2012, the passage of a state bond referendum made it possible for the university to not only upgrade its network security and access, improve WiFi access, and add features such as new charging stations all over its campus, but it also allowed the university to make improvements to its teaching and presentation technologies. At the time, the university was still using old screen projector technology, which needed about 15 minutes of prep time whenever a presentation was planned. Additionally, the classrooms were equipped with regular blackboards that didn’t take into account the changing needs of the digitally mobile student body. The university installed approximately 40 Sharp AQUOS BOARD interactive display systems in strategic locations around the campus, such as the library, athletics department, board room, conference rooms, nursing departments and select classrooms, to increase collaboration among the students and faculty. To accommodate ad hoc and temporary use, a number of AQUOS BOARD displays are kept mobile in order to be wheeled to different areas on campus as needed. These LED-LCD interactive displays provide touch-screen convenience, and WiFi connectivity. Additionally, more than 50 Sharp professional displays and monitors are being used as digital signage across the campus. Recently, the university unveiled a 4,000-square-foot nursing skills facility, which includes a simulation laboratory and a digitally-enhanced classroom. The lab is outfitted with educational training mannequins, a control room with tinted one-way glass, and the capability to record video simulations. 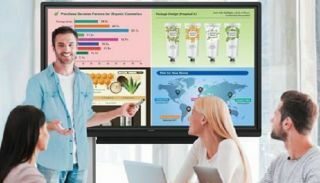 The 960-square-foot lecture classroom includes a 60-inch central AQUOS BOARD display and six satellite monitors that provide a visually stimulating environment, particularly effective for the visual, auditory and kinesthetic learner. The Athletics Department uses the AQUOS BOARD to get an edge on the competition. The coaches use them to show video to their teams and to highlight key plays, using the technology to break down video and take a closer look at the opposing teams. “We think of the displays as providing us with a competitive advantage over our league opponents,” says Mark Corino, head men’s basketball coach and assistant vice president and director of athletics. The Sharp PN-L703W has a built-in wireless controller that enables multiple devices to connect wirelessly via dedicated connection software. Users can connect with multiple mobile devices and simultaneously display the onscreen contents of those devices in a split screen. The display also readily integrates with select applications through Sharp strategic alliances.